Hello and welcome to the digital part of digital storytelling! If you are reading this page, you are probably in one of my digital storytelling workshops, or are simply looking for resources about storytelling in education. Whether or not you are in a workshop, feel free to use any materials you find here. Storytelling in five parts. I have divided my storytelling resources into five parts, each with its own web page. This is Part III- The technology and techniques of digital storytelling. 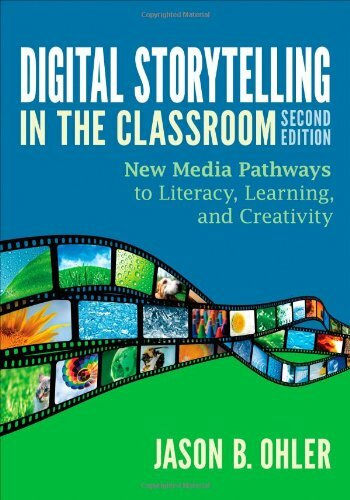 It addresses the technology needed to create digital stories, as well as various techniques for using technology effectively. This site has a strong media literacy component, showing how to help students understand the persuasive nature of media. If you are attending a workshop, or if you simply want to know more about the many facets of digital storytelling, please read this web page, as through the links to all of the digital storytelling resources on the right. This site is geared toward the classroom teacher. I assume you have limited time and resources to spend on incorporating digital storytelling into your curriculum. That is why I tend to think in terms of low budget projects that can yield high academic and creative returns. Hardware - a reasonably recent computer, a digital camera, a flatbed scanner and a microphone; perhaps (but not necessarily) a video camera and a music keyboard. More about this later. Software - a movie/media editing program (like iMovie on the Mac or Movie Maker II on the PC), an image editing program (like PhotoShop or GIMP though there are many free programs these days) and an audio editing program (like Audacity or the audio capabilities that are part of the movie editing program). That's the short answer to a complex question. If you have these things you can do a great deal in your classroom and will be all set for a workshop. But there's a good deal more to consider (like using video, finding software, buying gear, etc.). So, I recommend you scan the information on this page so you understand the depth and breadth of your options in creating and telling digital stories. In my workshops I like to use the equipment that teachers have on hand. This makes it more possible for teachers to transfer what they learn in the workshop to their classrooms. The good news is that there is a lot you can do with what seems like very little. On this web page you will find references to low and no cost software, where to buy software with an academic discount, and many other resources. By the way, I also like to model new and evolving technologies so teachers have an idea of what to expect. My motto is one eye on today's classroom, one eye looking down the road. We need to focus on what's happening today, while anticipating what could happen tomorrow. If I could clone myself, one of my clones would do nothing but try to stay on top of all the digital gear that is being developed and offered through the internet (...other clones would conduct the New York Symphony and model for GQ). It would take a full time job to find all of the gear, compare it, and then make cost vs. features recommendations, a process that would need to be repeated every month to address the constant evolution of technology. The reality is that I find what to buy the way you do, by searching the internet and talking to colleagues and field professionals. And, like you, I am overwhelmed by what I find. I simply make the best decision I can given my needs, budget, and the time I have to spend looking. First, determine whether there are any "gotta have" features. For example, when I bought five consumer quality video cameras for a media production program, I knew the cameras had to have headphones and external mike jacks or else they would be useless. It turns out that these are very hard to find on consumer gear these days. It took the better part of day to finally find them. But you gotta have what you gotta have. Second, stand on the shoulders of previous shoppers. You are networked with all sorts of people who buy gear, including friends, colleagues and family members. Ask them where they shop, what they bought and how they like it. You might even ask them if you can borrow their gear for a few hours to see how it feels. Lastly, set "search time" budgets. I don't have hard and fast rules in this regard, but generally if I am looking for something fairly low cost (under $200), I won't spend more than an hour looking for the best deal. The more expensive, the more time I will allow. Bottom line: Figure out the "gotta have" features for your gear, ask others what gear they buy and where they buy it, and give yourself a "search time" budget.